Our partner companies are amongst some of the most influential actors in the hard- and software industries. The close ties we enjoy to them allow us to rapidly and effectively implement future innovations and trends from within a variety of areas. 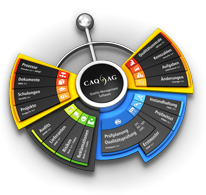 This allows us to ensure that today’s CAQ.Net® software is always ready for whatever tomorrow may bring. Excerpt of ERP-systems connected to CAQ.Net® via the Connect.Net interface module. Excerpt of measurement systems and gauges connected to CAQ.Net® via Connect.Net, APE.Net, or direct interface. Product and company names used on this website may be the trademarks or registered trademarks of their respective owners.